Why go? For a relaxing break spiced with the warmth and exoticism of North Africa. 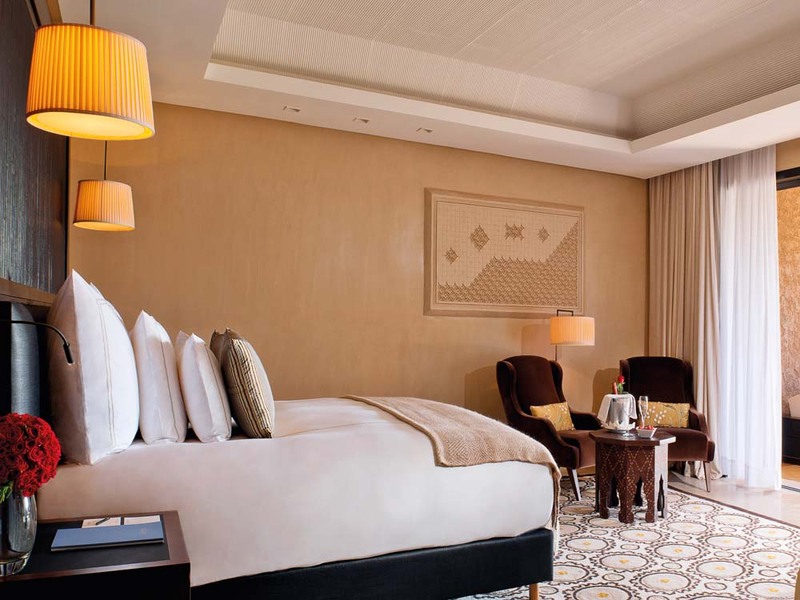 A 40-minute drive from the airport, the Royal Palm Marrakech offers exuberant A-list luxury but without being scary. You can, however, smell the ‘no expense spared’ attitude of its creator, Beachcomber Hotels, who also have five-star resorts in Mauritius and the Seychelles. 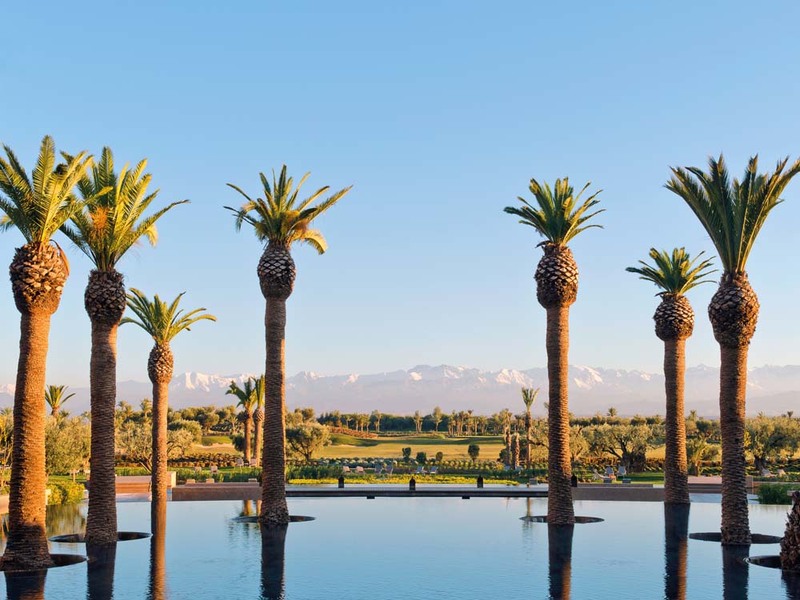 The estate is vast with panoramic views of towering palms, red earth, the Atlas Mountains and a manicured golf course, while its grand, golden-arched buildings come with a 2,000 square-metre heated ozonised pool and more ancient olive trees than the Garden of Gethsemane. When? 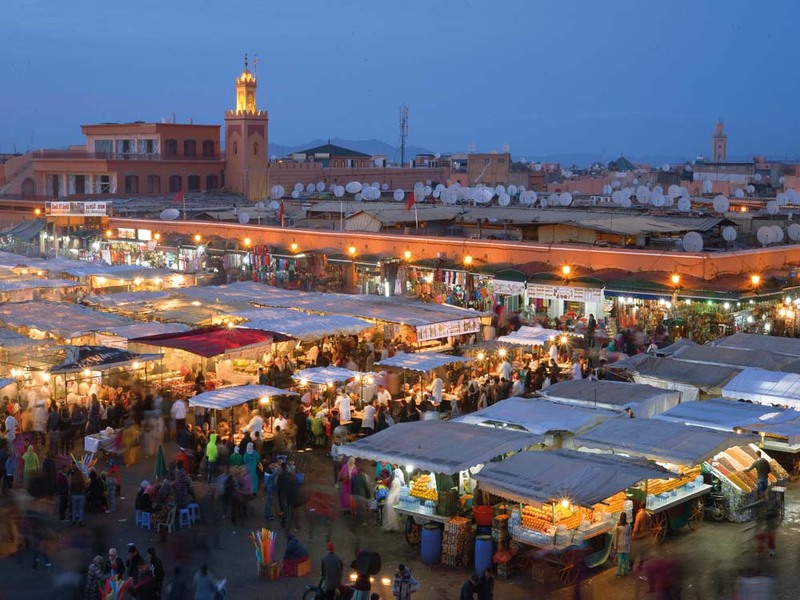 Marrakech is a year-round destination. Spring and autumn sees the city at its best with guaranteed sunshine and perfect weather (days are warm, nights not too cold). At the height of summer daytime temperatures can reach a scorching 38°C and it’s worth noting that shops and restaurants often close in the day during Ramadan (18 June-17 July 2015). Winter is often warm and free of crowds, but temperatures drop dramatically at night and you’ll need to wrap up. 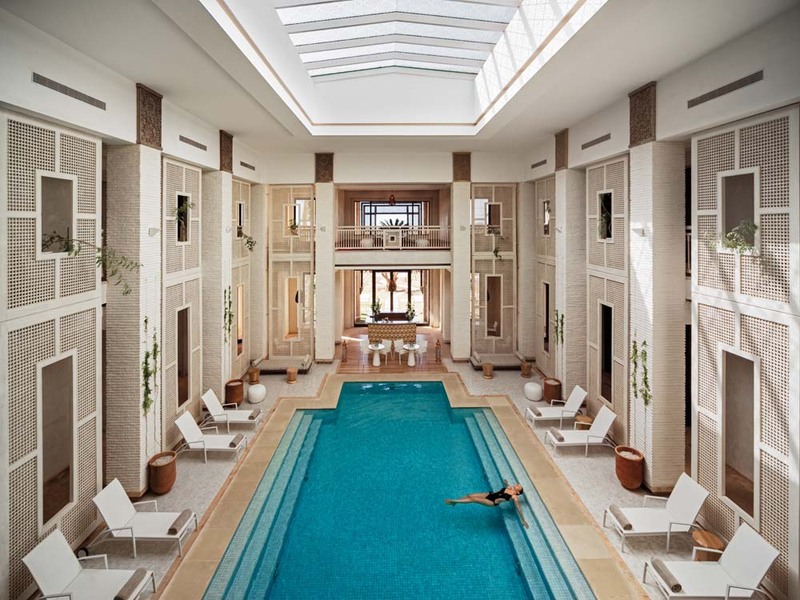 Stay at: The Royal Palm Marrakech (junior suites from £349, beachcomber-hotels.com) has 134 suites and villas spread over 231 hectares (tip: try to bag one with a spacious balcony overlooking the pool – you’ll feel la bit more in the middle of things). Each villa is intimate with a private swimming pool while the resort facilities include a huge pool area and many water features (seeing such an abundance of water makes you feel hydrated even when it is hot, as do the vast stretches of green grass). The estate is so well maintained it seems to have become a bird sanctuary, which is a welcome contrast to the frantic beeping of traffic in the centre of Marrakech. In the hotel the ridiculously grand rooms have pure coffee-table-book interiors: earthy and rich with mahogany dressing rooms and beautifully carved ceilings, hand-woven Berber rugs, massive beds with Egyptian cotton linen, large flat screen TVs, intricate tiling, carved plaster and beautiful furniture. This is one of the few places I’ve been to in recent years where I would be happy to have all the furnishings in my suite shipped home for my house. You really must… If you’re looking for a health retreat with sunshine then this is the place. There’s a 18-hole golf course, a sports centre equipped with a semi-Olympic-size heated pool and a blissfully hushed Spa by Clarins complete with hammams where again no expense has been spared, from the intricate carving of the walls to the electric adjustable massage beds. The therapists deliver massages that are smooth, firm and steady (from £54 for 60 minutes). I suggest going for a traditional hammam in the spa first to loosen up your body and melt away all the knots. Dine at: One of the Royal Palm’s three restaurants – either in the courtyard, under the stars, or on your own roof terrace. We ate in the Al Ain restaurant more than once as the cuisine is a big deal here and the food delectable – succulent lamb chops, perfectly grilled fish and vegetable tagines (vegetarians should ask the waiter what makes up the mezze delights: brain was not a welcome surprise). Breakfast is a buffet-style feast of meats, cheeses, cakes and eggs. Grilled tomatoes and the freshly squeezed orange juice were particular favourites. Bring home: Make sure you hit the hotel shop – good buys are aromatic Moroccan spice candles, great quality argan oil, tunics and hand-woven straw sun hats. It’s not cheap but the treat of having the best of what’s on offer in the medina in one place more than makes up for the extra euros spent. If you are inclined to leave this paradise to venture into the souk, hop in a taxi (it takes 20 minutes at a set price of €25 (£18) if booked through the hotel, but you can negotiate a better price with a local taxi, provided you don’t mind a more shabby vehicle). The souks are separated into different areas selling carpets, antiques, garden tables, spices, rustic leather sandals, as well as herbs and much more. While brilliant for bargains, they can be a little daunting if uninitiated. Be prepared to haggle – we left with three large silk carpets in a riot of colours and a hippie blanket for a bargain €300 (£217). I was also delighted to find a rather heavy and bulky iron and wicker chair that cost a mere €30 (£21) with an additional €60 (£42) for shipping to the UK. While the delivery took four weeks, the wonders of Google Translate meant I could check the progress with the owner of the shop with surprising ease. Book now: easyJet (easyjet.com) flies to Marrakech from four UK airports, from £47 return. The city is just over three hours’ flying time from the UK (with no time difference). Beachcomber Tours (01483 445 685; beachcombertours.co.uk) offers a three night package staying in a junior suite at Royal Palm Marrakech from £2,258 per person based on two sharing, including flights with British Airways, private transfers and breakfast. Info: Morocco (Rough Guides; £16.99) is an in-depth guide, while DK Eyewitness Travel Guide: Morocco (DK; £16.99) offers maps and best routes to see the sights. Also see visitmorocco.com.